Hi there, I returned from my third trip to the Rio Capim area of Pará, Northern Brazil about 5 weeks ago, having been out there for exactly a month. Now, whilst this was strictly a business trip I always make time to tune around the bands, mostly shortwave, in the hope of copying some interesting DX. My previous two trips were reasonably successful; however, I didn’t really hear anything new – just lots of Tropical Band – and tropical stations with much greater signal strength and clarity. Part of the problem is one of which most of us suffer from – the dreaded local QRM. Even in the depths of the rain forest noise is present from building electrical systems (particularly lighting) and other equipment. In my first attempt to escape the noise on this trip I ventured out of my accommodation building (basically a very large hut) to the wire fence that separates us and the larger fauna (although having said that, the monkeys and everything else that lives in the area appears to have no difficulty scaling a 6 foot fence – funny that! ). Anyway, ultimately, you’ve really got to want to hear something special quite badly to venture out. I suppose it could be the definition of hard-core DX! I tried this only once because as I was copying a very nice signal from Radio Guinea on 9650 kHz, I found myself about 2 feet from a Tarantula Hawk Wasp dispatching a very large spider (check out the very brief video on my YouTube channel). That was me done for alfresco DXing in the jungle. Fortunately, I was lent a 4-wheel drive truck for the duration of my visit and so I decided to find a quiet location to park up and listen to the radio – therefore only having to venture outside (at night) to place my antenna. One evening after dinner I got in the truck and drove around the site for a while until I found a location, effectively on the edge of the jungle that was mostly very quiet. Perfect…as long as I didn’t end up as something else’s dinner. 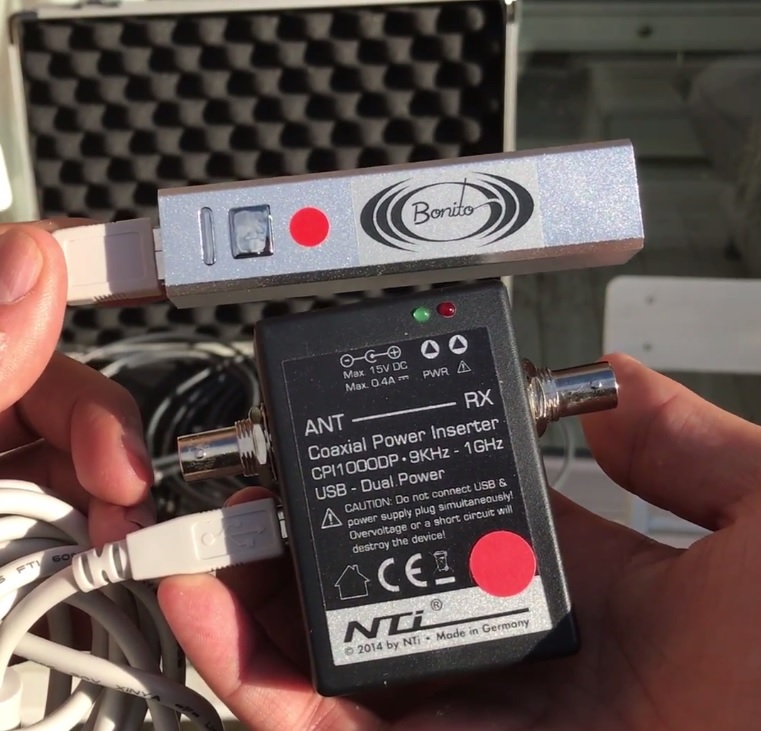 I took the super-compact USB-powered Bonito MegActive MA305 antenna with me on this trip because I’d already tested it at home on DXpeditions and in Crete and thus I was confident as to how superbly well it would perform in a quiet location. To supplement my antenna choices, during the first weekend, I made the 90 km drive to the nearest town and bought, amongst other supplies, a 40 metre length of speaker wire and a 3.5 mm jack connector to make a temporary long-wire antenna. In my experience, there are roughly 3 tiers of Tropical and Tropical Band DX on short wave. 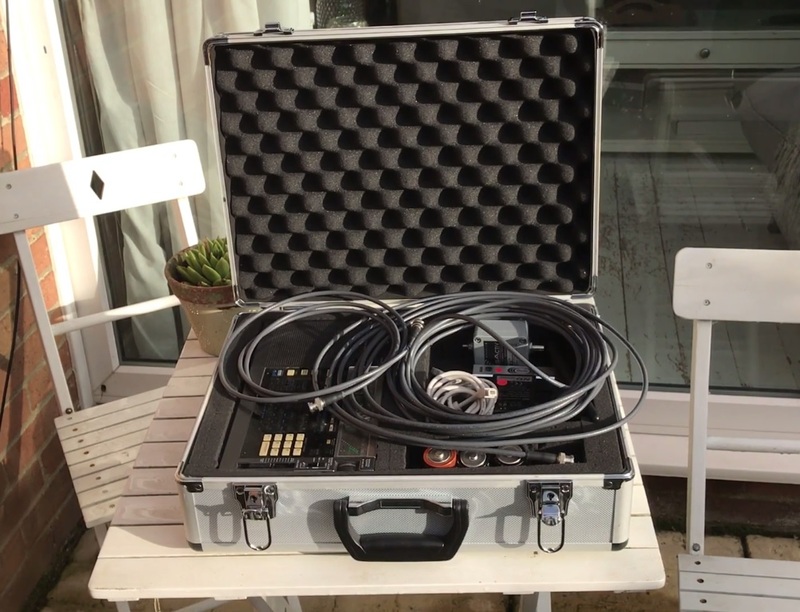 There’s the bottom tier of stations which with a decent portable and a few metres of wire can be readily heard in the UK on a Dxpedition – and at home with a magnetic loop antenna, for example and a good quality table-top receiver or SDR. Amongst this group of signals I would include Rádio Clube do Pará, Brazil on 4885 kHz, Radio Difusora Roraima on 4875.3 kHz, Emisoras Pio XII 5952.5 kHz, Radio Santa Cruz, 6134.8 kHz etc. etc. On the next tier are tropical stations that are really difficult to hear in the UK – but can be heard with good propagation and good equipment. This group includes Radio Aparecida on 6135.2 kHz particularly, Rádio Educação Rural on 4925.2 kHz, Radio Tarma Internacional on 4774.9 kHz, Rádio Evangelizar (formerly Radio RB2) on 6040.7 kHz etc. There are many more examples from these two groups I could use, but you get the picture. Lastly, there is a tier of stations that are very rarely or never heard in Europe, irrespective of equipment or propagation. Often these stations operate with low TX power which makes them extremely difficult to copy anyway – and that leads to ambiguity farther as to whether they are even on-air. Furthermore, some of these stations broadcast very irregularly, which makes copying them even more of a lottery. In this context, a month in Northern Brazil was a useful timescale for surveying the Tropical Bands and geographically tropical stations for the presence of very rare signals. Fortunately, over many hours of listening in Rio Capim with the Eton Satellit and mostly the Bonito MegActive MA305 antenna, I manged to record six signals that are very rarely heard outside of South America. The list of stations follows below, complete with the antenna arrangement. Further below you will find embedded reception videos and text links to the same videos on the Oxford Shortwave Log YouTube channel. Please take the time to watch the videos and note the comments made by some of my subscribers with local knowledge. In particular, Rádio Gaúcha and Rádio Canção Nova on 4825 kHz are very irregular broadcasters and therefore I was fortunate to be in the right place, at the right time to copy their signal. More luck came my way with the reception of Radio Sora de Congonhas on 4775 kHz – made possible because of a total power cut on site, reducing noise effectively to zero (I was indoors at the time). I, personally, never heard anything else other than Radio Tarma, Peru on or around 4775 kHz – itself something of a rarity, except when conditions are very good. 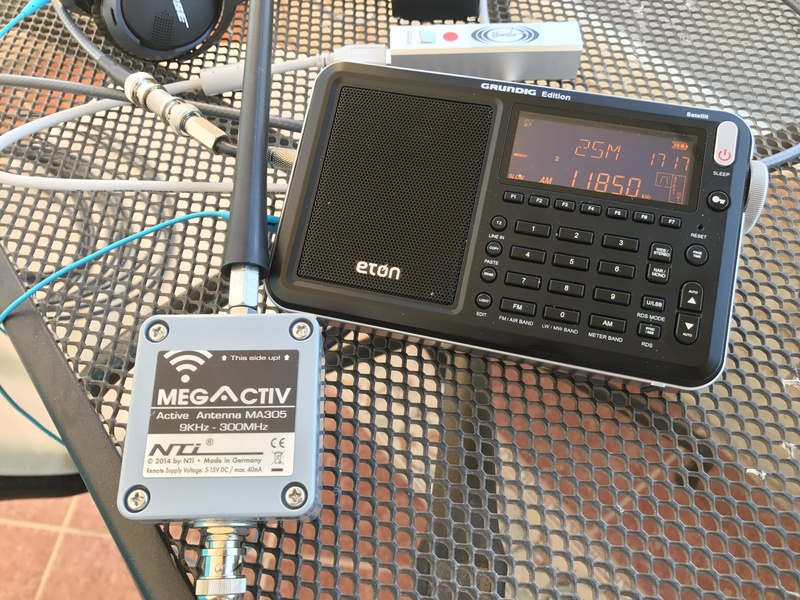 In conclusion, I have to say, once again, the DXing credentials of the Eton Satellit and the Bonito MegActive MA305 USB-powered antenna are clearly demonstrated here. The perfect travelling companions for the serious DXer and broadcast band listener alike, I had no issues getting through security at any of the airports and their combined weight is unnoticeable in a fully loaded backpack. I definitely recommend both products. It’s also worth noting that if you’re travelling to a relatively remote location, even with modest equipment, you might be able to copy rare signals that will provide good information to the rest of us trying to hear those same signals from 1000’s of km away. I will be returning to Rio Capim early in 2018 and I’m seriously considering taking my Perseus SDR with me. A superbly sensitive and selective receiver with noise reduction that actually works, it opens up the possibility of even more exotic DX on that trip. As always, thanks for watching/listening/reading and I wish you all excellent DX and Season’s Greetings. 73! This entry was posted in AM, Antennas, Broadcasters, DXpeditions, International Broadcasting, Portable Radio, QRM, Radios, Recordings, Reviews, Shortwave Radio, Shortwave Radio Reviews, SWLers, Ultralight DX, Uncategorized and tagged Bonito, DXpedition, E-field antenna, Etón Satellit, MegActive MA305, Oxford Shortwave Log, Radio Apintie, Radio Cançao Nova, Rádio Gaúcha, Radio Sora de Congonhas, Radio Verdes Florestas, shortwave on December 20, 2017 by Clint Gouveia. Hi there, the garden at my house is pretty small and as a consequence, I am very limited in terms of what antennas I can usefully employ. You can’t position anything further than about 10 metres from the brickwork and to compound this, we are surrounded on all sides by neighbours in close proximity. All very nice people, but all very noisy – electrically speaking lol. I simply can’t get far enough away from these sources of electrical noise to achieve excellent SNR. The solution to my problem was ultimately a Wellbrook ALA1530 magnetic loop, but prior to that I used an end-fed random wire, the performance of which deteriorated as the months went by as the ubiquitous blanked of local QRM continued to increase. Eventually, I was forced outdoors, well away from my town – effectively catalysing my forays into the Oxfordshire countryside on DXpeditions. That first experience of listening to the radio on shortwave, in the absence of any QRM was enlightening to say the least and of course, subsequently, DXpeditions have become a mainstay of my listening activities. 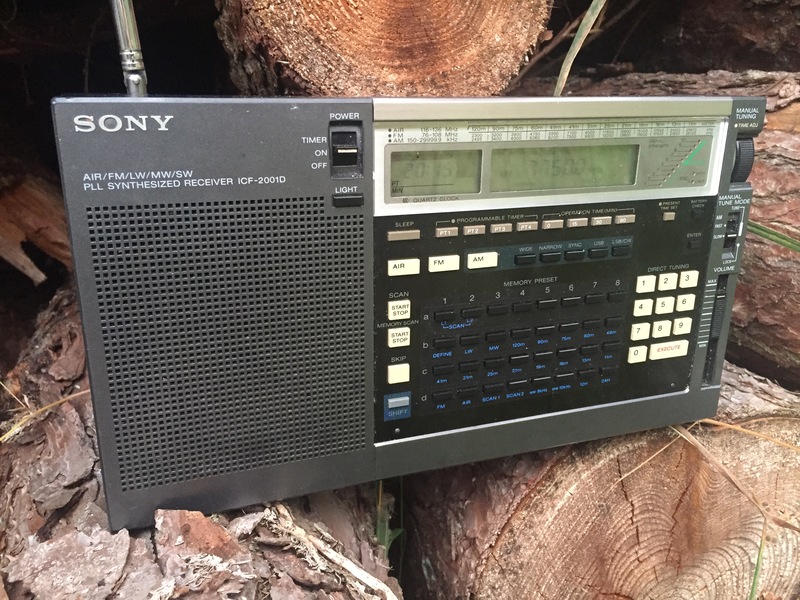 However, despite enjoying some great DX successes out in the woods, one has to be realistic about how often it’s possible to leave the house just to listen to the radio. This led me to the purchase of the Wellbrook ALA1530 magnetic loop. It proved to be a triumph of electrical noise mitigation and an absolute necessity in copying transatlantic medium wave signals in such a noisy and compact space. A total game-changer. The brilliant performance of the Wellbrook eventually led to me purchase a second, cheaper active antenna; the E-field Bonito Boni Whip and in turn, that purchase led me to the MegActive MA305, kindly supplied by Bonito themselves for objective testing. You might remember my initial tests at home confirmed, as expected, that E-field antennas don’t work well in electrically noisy environments (except at LW frequencies in my experience) but outdoors, away from noise, they are superb. 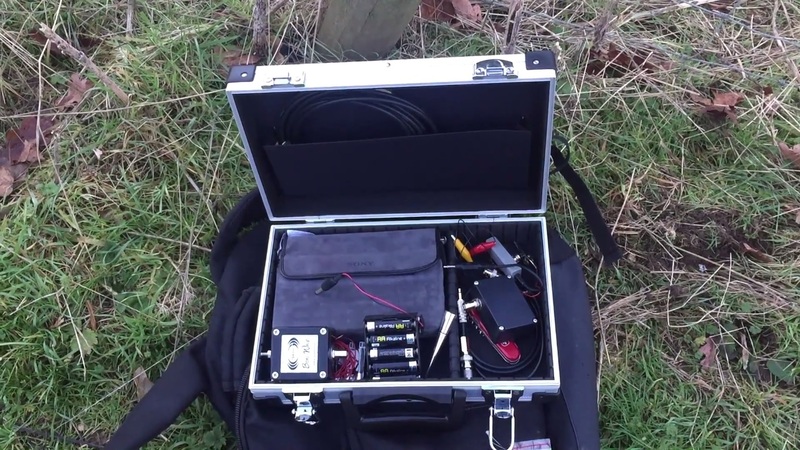 I have a number of reception videos on my YouTube channel – Oxford Shortwave Log which clearly demonstrate identical performance of the Bonito MegActive MA305 antenna and Wellbrook ALA1530 magnetic loop out in the woods. So, what if you’ve got a large garden in a suburban area that allows you to be just far enough from sources of electrical noise…how much of a difference does it make to the noise floor of your receiving equipment? Can E-field antennas such at the Bonito MegActive MA305 do the job? Furthermore, how well does a random wire work in a larger garden? I was fortunate enough to know someone who owns a house with a large garden, quite close to my QTH (a 10 minute walk) and who was more than willing to let me set up my DXing equipment and sit around until the early hours of the morning, listening to and recording various signals on my Eton Satellit. In preparation, I set up the Bonito MegActive MA305 antenna and hung the radiating element on the washing line – sounds ridiculous but actually worked very well, placing it about 2.5 metres above the ground. I also set up a 40 metre longwire, which at its closest point, was still approximately 25 metres from the house, and 30 metres from the neighbours. This post will focus on the performance of the MA305; a subsequent post will detail the performance of the longwire. Suffice to say, the MegActive MA305 performed admirably during my first listening session. In the middle of the afternoon I copied a very strong signal from The Voice of Korea around 15:44 hrs UTC on the 25 metre broadcast band, followed at 17:10 hrs UTC with a superb signal from The Voice of the Broad Masses 2, Eritrea, on the 40 metre ham band. Later on in the evening I copied Radio Mail with excellent modulation, CHU Canada with voice announcements (almost impossible at home), Myanmar Radio with an untypically strong signal and XEPPM Radio Educación from Mexico City with a signal I would normally expect on a DXpedition-proper with a large antenna. 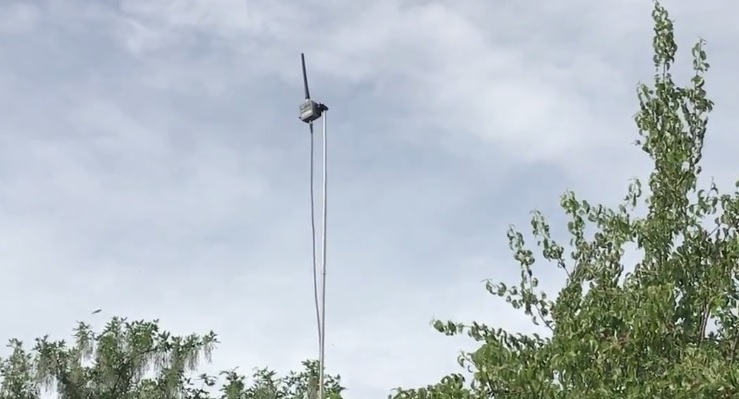 My conclusions to this experiment are simply that E-field antennas can work in a suburban environment, if you are able to site them far enough away from adjacent sources of electrical noise. I don’t have empirical data on this, however, I can confirm that 10 metres proximity is too close at my QTH and 30 metres is sufficiently far away at this test location. One has to assume the houses nearby are similarly equipped to mine with electrical appliances that generate electrical noise. 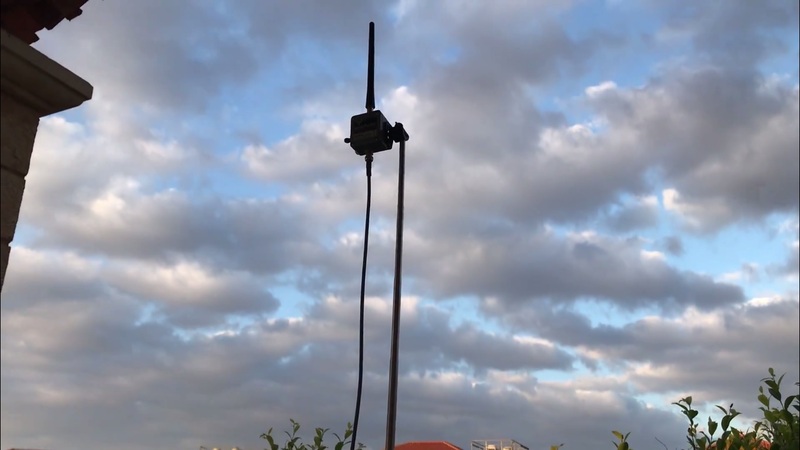 Thus, if you’re interested in a very well-priced, compact antenna and you live in an urban or suburban environment with access to a large garden/ outdoor space, an E-field Boni Whip or MegActive MA305 might well be suitable – and you’ll have a superb portable antenna for those listening sessions away from home! Finally, I should mention the Eton Satellit. Much-maligned in certain quarters when it was first introduced into the market, it continues to demonstrate superb DXing credentials. I won’t forget some words of wisdom from a friend of mine and fellow DXer, with more than 3 decades of experience in listening to the bands on HF. He told me that Judging from his own experience with some of the original Grundig Satellit models of the 1980s and early 90s (namely the 400, 500 and 700) he was quite sure that the Eton Satellit is a considerably better DX performer than those vintage sets, that offered great sound for casual listening to international broadcasters, but didn’t perform too convincingly on weak DX signals. The Eton Satellit has been a revelation and I’m pleased to have played a small part in turning around the rather widely held view that it was less than worthy of the Satellit branding. Please find embedded reception videos below and text links to the Oxford Shortwave Log YouTube channel. My next post on this subject will cover the performance of a 40 metre longwire in this large garden environment. Thank you for reading/watching/listening and I wish you all great DX! This entry was posted in Antennas, Broadcasters, DX, DXpeditions, International Broadcasting, QRM, Radios, Recordings, Shortwave Radio, Shortwave Radio Reviews, SWLers, Ultralight DX, Uncategorized, Videos and tagged Bonito, CHU Canada, DXpedition, Etón, Etón Satellit, MegActive MA305, Myanmar Radio, Radio Mali, Recordings, Satellit, shortwave, Shortwave Radio, suburban DXing, Voice of Korea, Voice of the Broad Masses, XEPPM Radio Educación on September 15, 2017 by Clint Gouveia. Hi there, you might remember my post from last month focussing on the Bonito MegActive MA305 E-field antenna, kindly supplied to me for testing, by Bonito themselves. 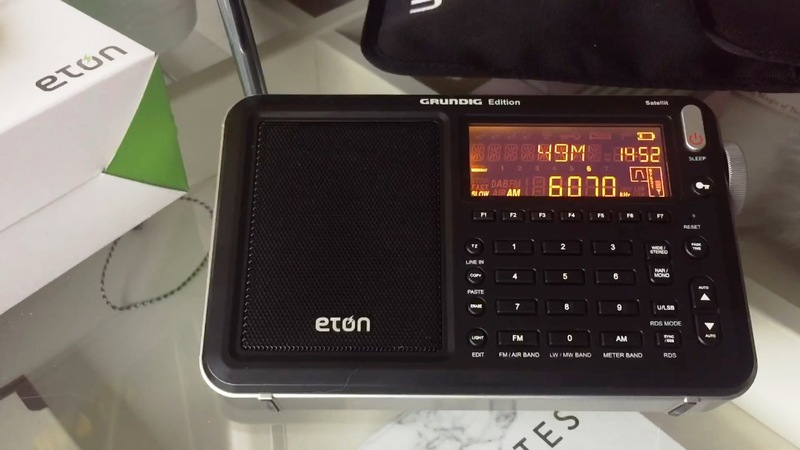 That post was essentially a report on my experiences travelling to Crete with the MA305, navigating through security at London Gatwick and Heraklion airports (mostly with relative ease), but more importantly, how well it worked with the equally excellent Eton Satellit portable receiver. Whilst in Crete I managed to copy a number of personal firsts, including CRI on 7295 kHz, via their relay in Bamako, Mali, The Voice of Beibu Radio on 5050 kHz, Nanning, XSL ‘Slot Machine’ on 6251 kHz USB, Ichihara, Japan, S32 ‘The Squeaky Wheel’ on 3828 kHz and NHK World Radio Japan, 11910 kHz. I also copied RTM Wai/Limbang FM on 11665 kHz from Kajang, Myanmar Radio on 5985 kHz and AIR Bhopal on 4810 kHz, amongst others – all of which I would certainly consider to be difficult catches in Europe. Despite excellent all-round results from the ultra-portable USB powered MA305, there was one signal I copied, which more than any other, demonstrated the DXing credentials of this antenna; Radio Tarma from Peru on 4775 kHz. With a TX power of 1 kW, this is a very difficult station to hear in Western Europe, even with a longwire. To catch this station in Crete, with a 22 cm antenna was incredible and it was at that point during my trip that I realised E-field antennas really can work superbly well for hard-core DXers on the move. Upon my return to Oxford, I immediately started thinking about a DXpedition to the local woods I use for what I consider serious DXing. For obvious reasons, E-field antennas require an electrically quiet environment to ensure maximum SNR performance. In noisy environments, these types of antennas amplify the signal of interest and the background ‘electro-smog’, thus increasing signal levels but critically, not signal-to-noise. 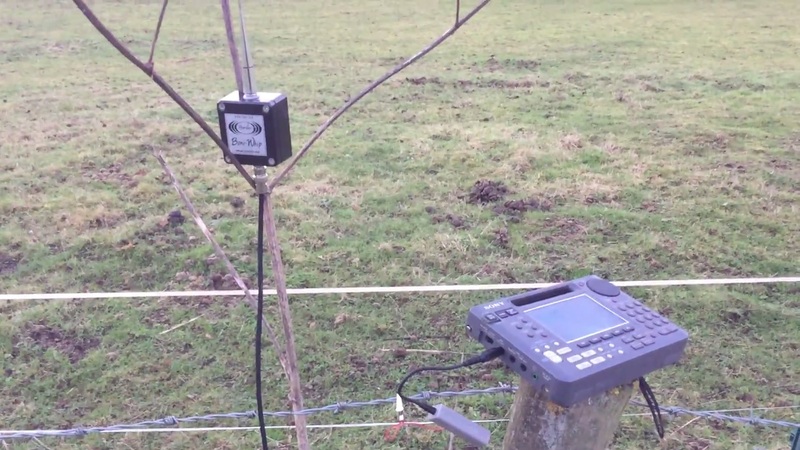 Fortunately, the Oxfordshire wood I have been using for a couple of years is only a 10 minute drive from my QTH as I sort of live in the countryside anyway and the QRM levels there are just about zero. Now, given that this was essentially an experiment to determine the best possible performance from the MA305, I decided to use my best portable radio. It was quite tempting to pack up the Elad FDM DUO which running on a home-brew battery pack has proven itself to be my best (pseudo) portable radio. 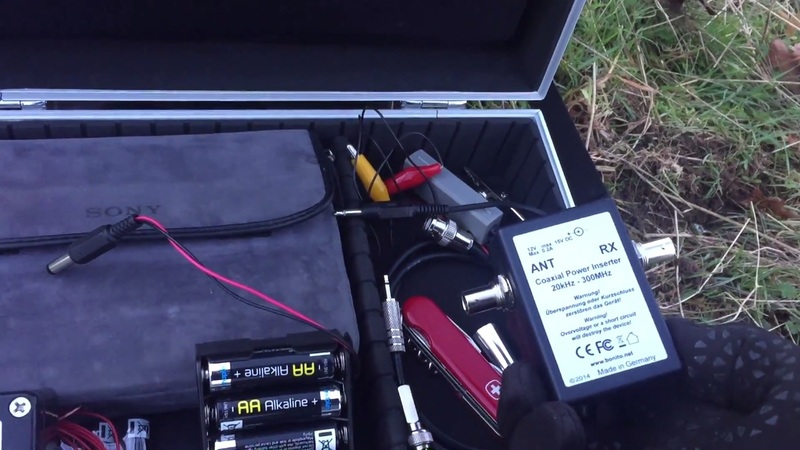 However, this is supposed to be a real-world test and in this type of scenario, DXpeditions with the Bonito antenna are much more likely to be undertaken with a portable radio. 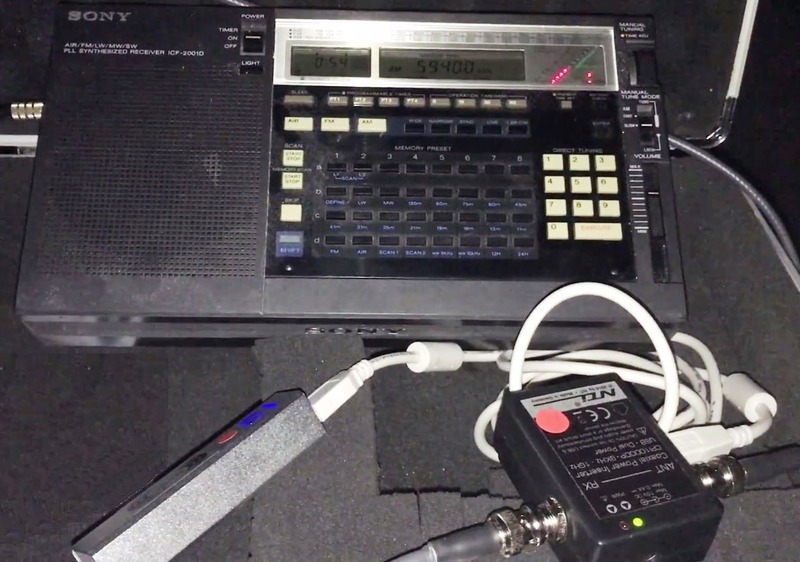 For these reasons I decided to conduct the test with the venerable Sony ICF-2001D. Having proven to be a superb receiver over many, many dxpeditions (check out the evidence on my YouTube Channel Oxford Shortwave Log) and still regarded by DXers as one of the best ever portable radios – possibly the best – it was the obvious choice. I ventured out in early June around 23:00 hrs BST (22:00 hrs UTC), parked the car on the edge of the wood and proceeded to set up my cheap camera tripod, slightly modified to accept a 2 metre-long stainless steel tube, into which a slightly thinner 1 metre tube was mounted, topped off with my partially disassembled ‘Selfie Stick’ – which made it back from Crete lol. The antenna was set up in less than 5 minutes and approximately 4 metres above the ground – much quicker and easier than de-spooling 100 metres of wire! With fresh batteries in the Sony and the MA305 powered up using the USB power brick supplied by Bonito, I was ready to start listening. Almost immediately I heard and recorded a personal first; Lao National Radio, Laos, signing on 6130 kHz, with an excellent signal. Hearing them in the UK was only made possible by the annual two week shut down of the PBS Xizang transmitter in Lhasa, Tibet, but hey, I’ll take it. A brilliant start to my listening session. Over the next two hours I was amazed at what could be heard using this 22 cm amplified antenna. Bearing in mind I have spent many hours at the woods previously, listening via various 100 metre longwires and a 200 metre Beverage, my expectations were, I thought, realistic in that the MA305 coupled to the Sony would catch some very good DX. However, I did believe there might be an absence of at least some of the more exotic low power stations on the Tropical Band – afterall the MA305 is a very short antenna. Clearly I was wrong, because what transpired during the session surpassed anything I thought possible with this set-up. A list of reception videos follows below and further below, a selection of embedded videos. Some of the entries on this list simply stunned me at the time. Rádio Educação Rural for starters is such an incredibly difficult signal to hear in Europe, even with a very large antenna. Thus, to hear them on an ultra-compact set-up felt very special. Radio Mali is another station that is very difficult to catch with any modulation, except on a large antenna and yet there they were – at the first time of trying. Similarly, Rádio Nacional de Angola and Alcaravan Radio are exotics that at best deliver very weak audio – and most of the time no audio. Furthermore, the signals from Emisoras Pio XII, Myanmar Radio and Rádio Clube do Pará were verging on what I would call superb…I’d never heard anything like it previously except via 100 (or more) metres of wire. So what’s next? 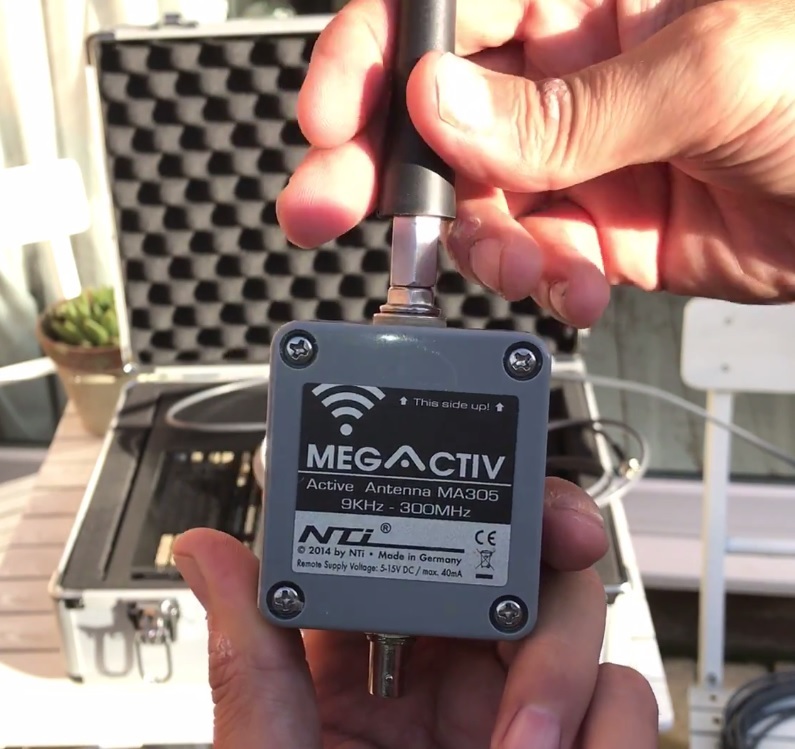 Well it would certainly be an interesting experiment to compare the performance of the MegActive antenna with the Wellbrook ALA1530 active loop in a similar environment. 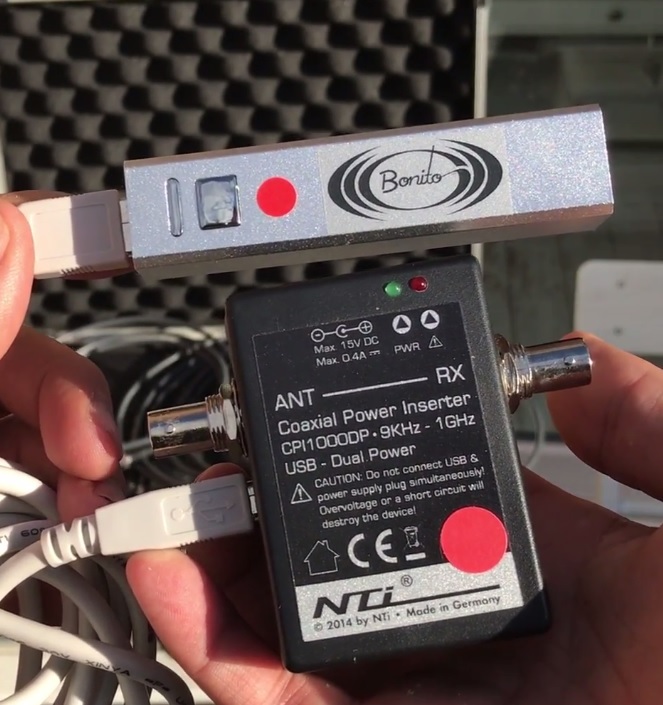 I have used the Wellbrook on DXpeditions several times, with often excellent results, however, it’s not designed to be portable and if SNR performance could be demonstrated as similar between these two products, given a very favourable price delta, the Bonito antenna would add up to be a very compelling purchase decision. More on that to come. In the meantime, thank you very much for reading/watching/listening and I wish you all excellent DX. Please click on the links below for the reception videos on the Oxford Shortwave Log YouTube channel. This entry was posted in AM, Antennas, Broadcasters, DX, DXpeditions, International Broadcasting, Portable Radio, QRM, Radios, Recordings, Reviews, Shortwave Radio, Travel and tagged antenna, Antenna review, Bonito, DXpedition, E-field antenna, ICF-2001D, MA305, MegActive, MegActive MA305, Oxford Shortwave Log, shortwave listening, Shortwave Radio, Sony, Sony ICF-2001D on July 12, 2017 by Clint Gouveia. Ok, so officially it wasn’t a DXpedition; it was a well needed vacation in the sun after several hectic months of work, some of which involved travel to slightly more exotic locations. However, these days, I view any travel, whether it be for business or pleasure as a ‘DXpedition’ opportunity! 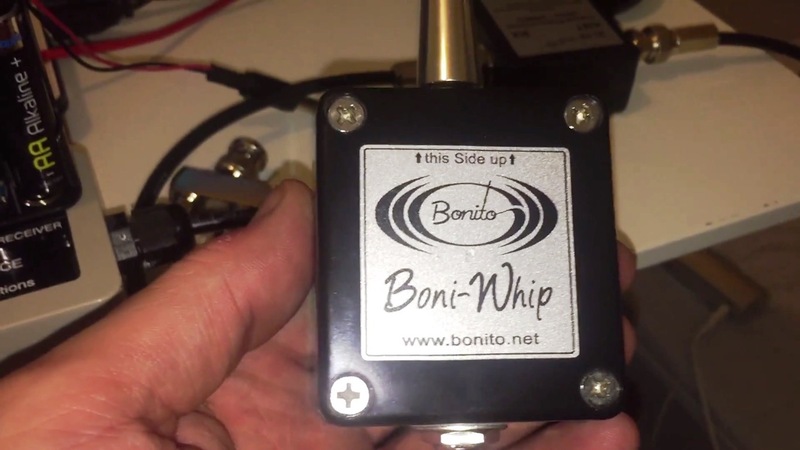 Some of you might remember that I purchased a Bonito Boni Whip at the beginning of 2017 because (a) I needed another antenna and (b) a second Wellbrook loop felt like too much of an extravagance. They’re excellent antennas for sure, but at around £300, I couldn’t justify buying another. Thus, for about a third of the price I bought the Boni Whip. 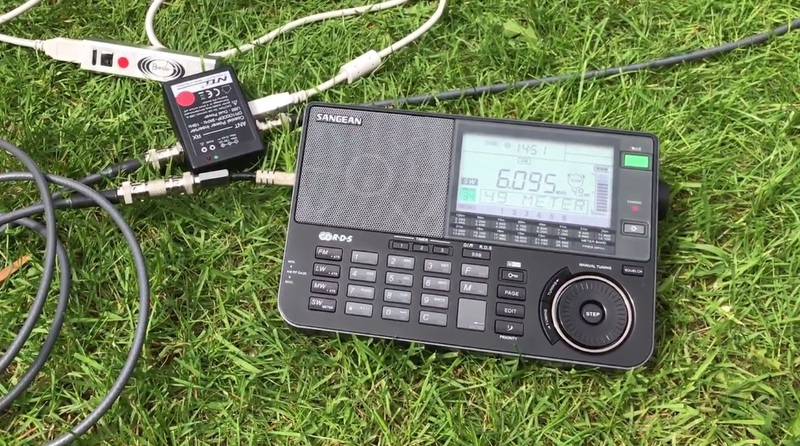 It proved to be an excellent choice – very compact and so perfect for my regular DXpeditions, quick to set up and capable of really excellent DX. There are many videos on the Oxford Shortwave Log YouTube channel that are testament to this. 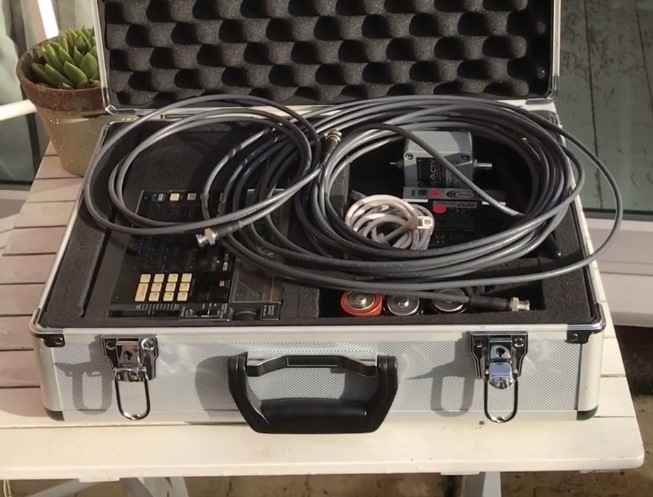 I wrote a couple of articles, published here on the SWLing Post which were seen by Dennis Walter of Bonito, who subsequently contacted me and offered to send over their MegActive MA305 E-field antenna for testing. Dennis made it crystal-clear that I was to ‘do my own thing’…test the antenna in any way I saw fit and publish my findings so DXers/radio enthusiasts could learn more about the capabilities of the antenna – from another DXer. I was happy to agree to this arrangement and the MegActive MA305 duly arrived, complete with two lengths of (bayonet BNC terminated) high quality H-155 coaxial cable. 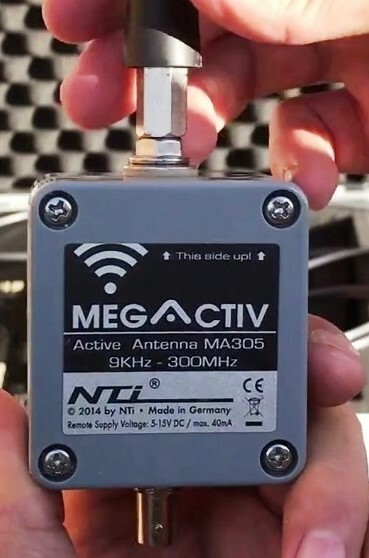 The specifications of the MegActive MA305 are very similar to the Boni Whip; they both offer a Gain of +3 dBs, second and third order intercept points of greater than +30 and +50 dB respectively and both tune to 300 MHz. The MA305 is supplied with a longer radiating element and tunes down to 9 KHz (versus the 20 kHz lower limit for the Boni Whip). Obviously this isn’t a specification that is going to concern most radio enthusiasts; both offer fantastically wide operating bandwidths. The way in which these antennas do differ quite significantly however, is in how they are powered. The Boni Whip operates from 12 to 15 V, whilst the MA305 operates from 5 to 15 V. Bonito’s design philosophy regarding this feature is based on the increasing difficulty in procuring reasonably priced analogue external plug-in power supplies (they are no longer allowed to be produced due to power consumption restrictions). Interestingly, when the power supply for my Wellbrook ALA1530 packed up, I called them to purchase a replacement and was told they only have limited stocks remaining. Thus, a solution for powering active antennas with a suitable low-noise supply is an issue that needs resolving. The guys at Bonito figured a USB power source was suitably quiet and with USB ‘power bricks’ almost ubiquitous these days for charging mobile phones and other portable electronic devices on-the-go, the idea could be applied to their active antennas. The result is the MegActive MA305, designed to operate at 5 Volts with no loss of performance. As a DXer who probably spends more time listening on DXpeditions than I do in my shack at home, the USB power solution was perfect. I myself often carry a cheap Chromebook laptop to use as an additional power source for my camera phone when I’m DXing, so Bonito’s design approach resonated with me completely. I explained to the (friendly) security chap that I was a shortwave radio hobbyist and identified the various pieces of equipment for him, as he removed them from my rucksack. He confirmed my X-ray had ‘lit up’ (in blue as it happens) with metallic/electronic items and was even kind enough to swivel his monitor to show me the mess of items strewn across the screen – just as I had thrown them all into my rucksack! However, after quickly swabbing some of the items, he said all was fine and hoped that I enjoyed my holiday and listening. Service with a smile at Gatwick Airport – and I was on my way. My outbound experience got me thinking whether it would be possible to pack my DXing kit in such a way that it wouldn’t alarm airport security. Thus, for the trip home, I packed all of my cables into my (checked-in) suitcase. I figured it would be obvious there was no security risk associated with cables alone. I then packed my RTL-SDR, upconverter and all of the MS305 components very neatly into a single box and put that in my carry-on rucksack. Now, some might argue that security measures at Heraklion International Airport in Crete differ a little from London Gatwick, but I observed staff at the X-ray machine very carefully monitoring every piece of luggage passing through it – including my own and I passed straight through without a problem. All I did was take my laptop out as usual, and put it in a separate tray. Job done. 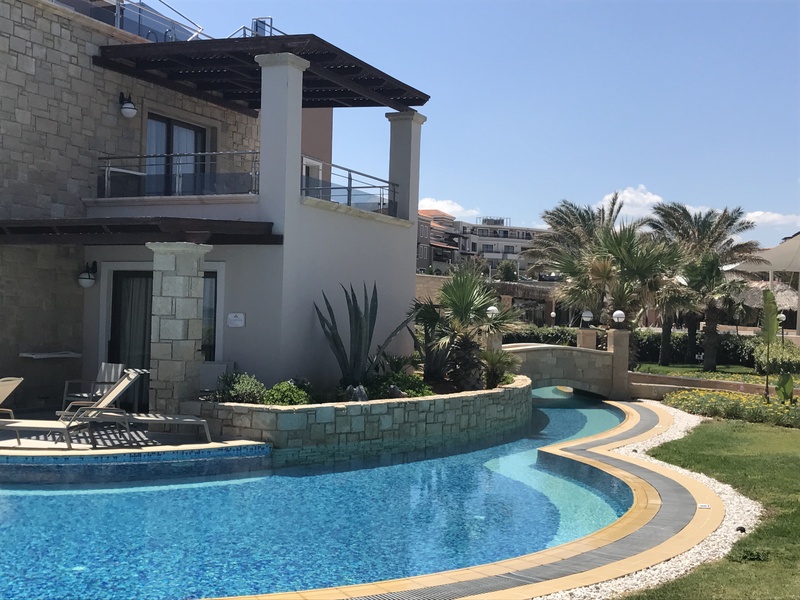 My apartment in Crete was on the second floor and a large balcony provided a decent outdoor location for DXing. As regards electrical noise, the location was much quieter than my shack at home, but it certainly wasn’t perfect, thus a good test of the MA305 in a real-world pseudo-urban environment. in an attempt to improve SNR, I bought a cheap ‘Selfie Stick’ and some tape and managed to construct a mount for the amplifier, increasing the overall height above ground by about 1.5 metres and displacing the radiating element an additional 2 metres thereabouts from the building. I’m not sure whether it made much difference, but it seemed like the sensible thing to do for less than 10 Euros. During my week-long stay, I managed to fit in several listening sessions and copied some really excellent DX from this ultra-compact, USB-powered set up. In fact, the MA305 coupled to the Eton Satellit performed so well, I managed to copy a number of personal firsts, including CRI on 7295 kHz, via their relay in Bamako, Mali, The Voice of Beibu Radio on 5050 kHz, Nanning, XSL ‘Slot Machine’ on 6251 kHz USB, Ichihara, Japan, S32 ‘The Squeaky Wheel’ on 3828 kHz and NHK World Radio Japan, 11910 kHz. I also copied RTM Wai/Limbang FM on 11665 kHz from Kajang, Myanmar Radio on 5985 kHz and AIR Bhopal on 4810 kHz, amongst others – all of which I would certainly consider to be difficult catches in Europe. To hear them with an 18 cm antenna felt pretty special. African shortwave stations were also very well represented and I managed to copy a number of them including Radio Hargeysa on 7120 kHz, Voice of Tigray Revolution on 59150 kHz, Radio Oromiya on 6030 kHz, Radio Fana on 6110 kHz, Radio Ethiopia on 7235 kHz, Radio Sonder Grense on 3320 kHz and Radio Guinée on 9650 kHz. I expected to hear all of these stations, except for Radio Guinée, which is farther away from Crete than the UK. So, all-in-all an excellent result. 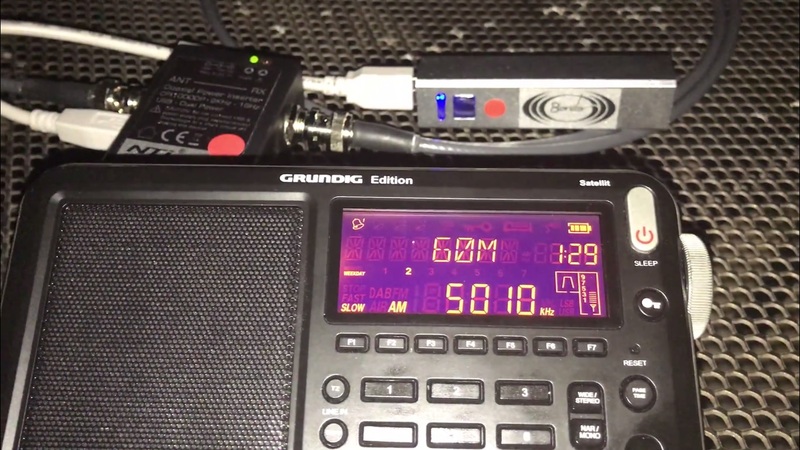 Despite hearing a lot of excellent DX whilst in Crete, there is one signal I copied, which more than any other, demonstrates the DXing credentials of the MA305 – and Eton Satellit for that matter. In the early hours of the morning (00:59 hrs UTC) I copied and recorded Radio Tarma from Peru on 4775 kHz. With a TX power of 1 kW, this is a very difficult station to hear in Western Europe, even with a longwire. To catch this station in Crete, at all, was incredible on an ultra-compact set-up. It was at this point during the trip that I realised E-field antennas really do work superbly well for hard-core DXers on the move. It inspired me to conduct further tests back home in the Oxfordshire countryside, where electrical noise is absent. This I did a few days ago, with some quite amazing results on the Tropical Band. More on that to come in my next post. In the meantime, please find text links and embedded videos for selected reception recordings, below. Many more recordings are available on the Oxford Shortwave Log YouTube channel and please don’t hesitate to contact me if you require further information on the MA305 or the Eton Satellit. Thanks for reading/watching/listening and I wish you all excellent DX. This entry was posted in AM, Antennas, Broadcasters, DX, DXpeditions, International Broadcasting, New Products, Portable Radio, QRM, Radios, Recordings, Reviews, Shortwave Radio, SWLers, Ultralight DX, What's On Shortwave and tagged Antenna test, Bonito, Crete, DXpedition, E-field antenna, Etón, Etón Satellit, MA305, MegActive, MegActive MA305, Receiver test, shortwave, shortwave listening, Shortwave Radio, Shortwave Radio Recordings, Ultralight DX on June 14, 2017 by Clint Gouveia.